The network sharing deal is limited to 2G signals, meaning that customers will see little benefit when using the mobile web. Analysts said that T-Mobile had the most to gain from the merger. "Outside of the South-East [of England] there has been a constant perception that T-Mobile is an underperforming network," said Shaun Collins of research firm CCS Insight. "This literally takes it away overnight." He said that network coverage was becoming a "key battleground" between the major UK networks. "The network coverage advantages of the merger [between Orange and T-Mobile] were always the most important part of it," he said. 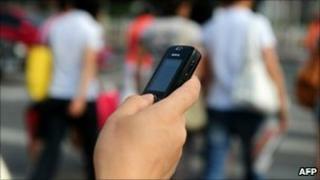 Customers of the two firms will have to sign up for the free "roaming" service, which goes live on 5 October. Once registered, their phone will automatically hop between the networks when it loses signal. The underlying system is similar to that used when a phone "roams" on a different network abroad. Next year Everything Everywhere - the company that runs Orange and T-Mobile in the UK - said that phones would automatically switch to whichever of the two networks has the strongest signal mid-call. It said it also plans to roll it out to 3G services. When it does, Orange customers will be able to use a 3G network owned and operated by Mobile Broadband Network Limited (MBNL), a joint venture company owned by Three and T-Mobile. Orange joined MBNL on the 16 August. "Everything Everywhere will be adding Orange sites to the network it shares with Three in the course of time, and Three customers will get access to a significant proportion of those as they are added," said a spokesperson for Everything Everywhere. Three customers are already able to use the Orange network for 2G calls and texts. Further down the line, Everything Everywhere aims to start building a next-generation LTE (long-term evolution) mobile network, to cope with the surge in demand for data and the mobile web. LTE offers faster speeds than current 3G networks and is able to handle more traffic. The UK government plans to hold an auction of spectrum for next generation services in 2011.